The PJ Library Program’s PJ Our Way website will have a local flavor. Dina Rubin, a fourth-grader at Moreland Hills Elementary School in the Orange School District, applied and was selected as one of 10 design team members. The website content is created and designed by the national design team, a group of children. “I wanted to meet different kids around the world and I wanted to test out the books,” said Dina, 9. She is working on creating her first book review and quiz. The PJ Our Way website is free and open to all Jewish children with adult moderation for safety. 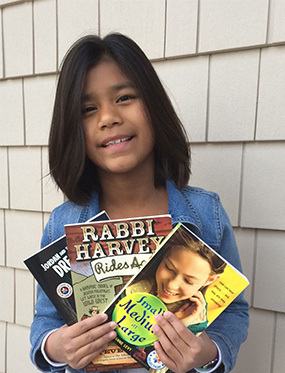 The PJ Library Program provides families around the world an opportunity to teach Jewish values and study related themes with its monthly book delivery program. Its companion program, PJ Our Way, offers a new scope of engagement opportunities for older children ages 9 to 11. “PJ Our Way is next step for kids who are already reading independently. It’s more interactive, and it’s more age appropriate,” said Aviva Roland, manager of youth family engagement at the Jewish Federation of Cleveland. PJ Our Way’s website, pjourway.org, allows Jewish children to create online profiles with which they can read and comment on book reviews, take quizzes and choose from a selection of more advanced books to receive in the mail. The PJ Our Way program is supported by the Harold Grinspoon Foundation. PJ Our Way is an extension of the successful PJ Library® program, a partnership with the Jewish Federation of Cleveland and the Harold Grinspoon Foundation that is generously funded in Cleveland by Mort (of blessed memory) & Iris November in celebration of Debra Ann November’s Life.